Silver Amalgam: This type of filling contains a combination of copper, mercury, silver, tin, and zinc with mercury making up about 50 percent of the mixture. It has been available for many years and remains the most popular. Although silver amalgam fillings can last for a lifetime, some patients don’t like the way they look in their mouth. Rarely, mercury fillings have come loose and caused an infection. Ceramic Fillings: Many people prefer ceramic fillings because they blend in well with the natural tooth color and are more aesthetically pleasing. Other benefits of ceramic fillings are durability and resistance to staining. Since these types of fillings are somewhat bulky, Dr. Qureshi may need to remove some of your tooth enamel to ensure that they fit properly. Fillings made of gold or glass are also a possibility, but they are not as common due to the cost of materials and difficulty of placing them in the mouth. Dr. Qureshi always discusses your options for filling material before he fills in a cavity. It’s important to him that you understand the advantages and disadvantages of each type so you can make an informed choice. We have found that patients at Smiles of La Grange are increasingly turning to composite fillings because they blend in so seamlessly. You don’t have to worry about others seeing a mouth full of metal when you smile or speak. 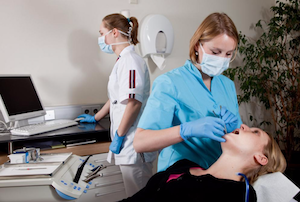 Others are perfectly fine with the traditional types of dental fillings. Whatever your choice is, we are happy to honor it.